Athletes, police, and warriors hate having the sun in their eyes but at an opponent’s back. It turns out, the sun can blind you and aid your enemy even in invisible wavelengths. The Allies faced that challenge in World War II. Previously fairly safe from invasion because of the English Channel, Great Britain became more vulnerable in the 1900s. German dirigibles maneuvered just as easily in the air over land and sea, and they dropped bombs on Britain in World War I. German airplanes did it faster and more frequently in World War II. For a heads-up about incoming bombers, the British took some ideas with German roots older than both wars. 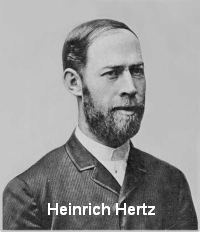 Heinrich Hertz, who studied radio waves in the 1880s, discovered they bounced off some objects. His experiments also showed that radio waves refract through the atmosphere. That’s how scientists learned radio waves and visible light are the same form of energy called electromagnetic radiation. Another German, Christian Hulsmeyer, developed a device called the telemobiloscope in 1904. When a ship came close to another ship, the radio signal that reflected back triggered a bell ringer. Hulsmeyer hoped to end foggy weather shipping accidents. However, shipping companies weren’t interested. In 1915, Scottish born meteorologist Robert Watson-Watt tried to bounce radio waves off distant clouds. He wanted to detect thunderstorms and warn Britain’s World War I pilots of them. However, with the technology of the time, it was easier to see the storm clouds. Practical use of radio reflections became serious business in the 1930s when the Nazis became a formiddable enemy. 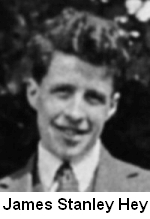 Watson-Watt got the job of developing a way to spot enemy planes. He successfully detected radio reflections off aircraft 200 miles away. This radio detection and ranging was given the acronym RADAR. Today radar is a regular word. 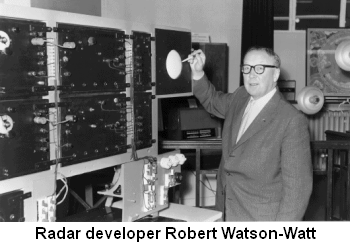 Eventually, radar became valuable not only for locating aircraft, but also for tracking severe storms as Watson-Watt sought to do in the first place. Radar led to an accidental discovery that opened new chapters in astronomy. In February 1942, English physicist James Stanley Hey looked into some unusual interference with radar signals at 50-75 MHz. The Nazis had learned about radar and generated their own radio signals to jam it. But the interference Hey studied was stronger and always came from the sun’s direction. The knowledge that the sun emits radio waves stayed secret during the war. The Allies didn’t want the Axis evading radar by simply flying in when the sun was behind its planes. If you have satellite TV and experience “solar outages” in the spring and fall, you can appreciate the problem. The signal loss happens while the satellite is in front of the sun. After the war, radio astronomy came of age, in part because of the new knowledge that the sun is a powerful radio source and in part because of a 1930s discovery that our galaxy’s center emits radio waves too.